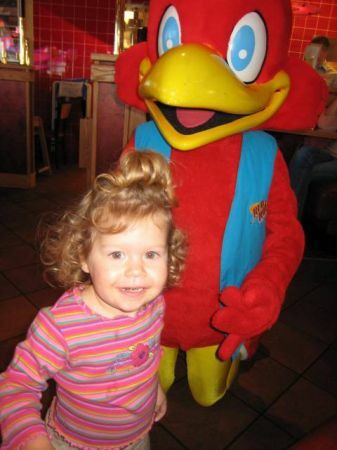 Red Robin wasn’t necessarily a frequented location for dinner for the Evans family. 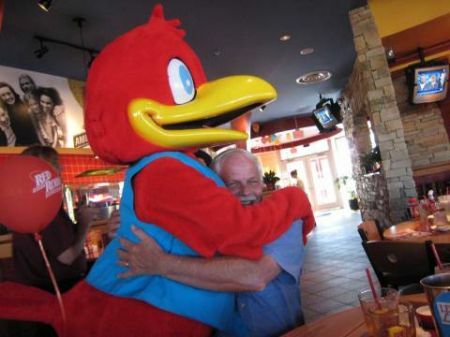 That is until we realized that Red Robin came out from behind the scenes to visit with everyone in the restaurant on certain nights. He was an instant hit with Mara, in contrast to how she reacts to Santa Claus. Since the discovery we have been there to eat probably every week for the last three or four weeks. 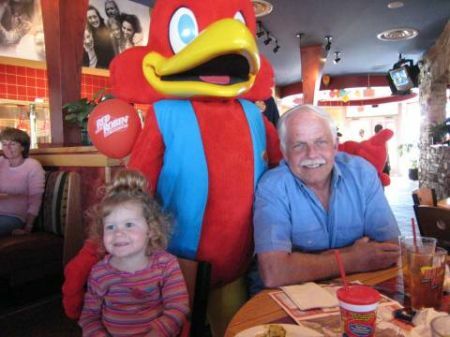 With Grandma and Grandpa in town, we wanted them to be able to witness the phenomenon that is Red Robin first hand. So we went on up there on Tuesday to see what we could see. They got to see a kid as happy as can be with the bird. Whoops, looks like Grandpa got more than he bargained for in his trip to eat a hamburger. Mara’s not the only one that likes the red bird. Uhhh, You See This Bird?!!? Mara, Grandpa, And The Bird. Click on any picture to see a couple more photos from Tuesday. The other pics are from our first visit. Oh, and Campbell was with us, but just snoozing.